Despite the weather most things are doing well. 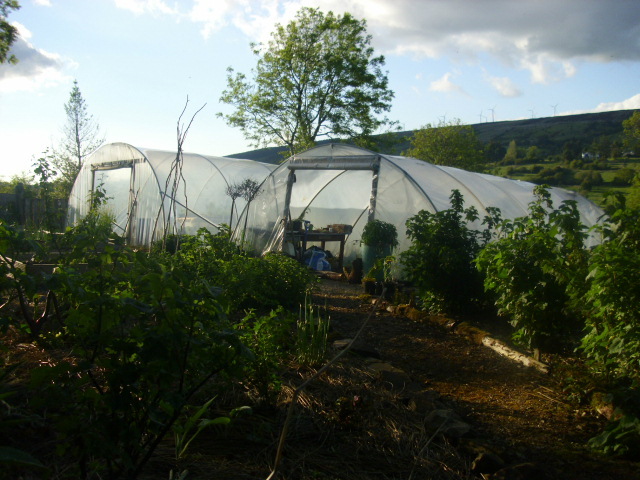 This is the small polytunnel, the middle bed is planted with Carrots, with Garlic at each end to guard against carrot fly. Some self-seeded plants were also left to add a bit of colour, Borage, Orach and Poppies all came free in the garden compost. One of the side beds is filled with Strawberry plants. 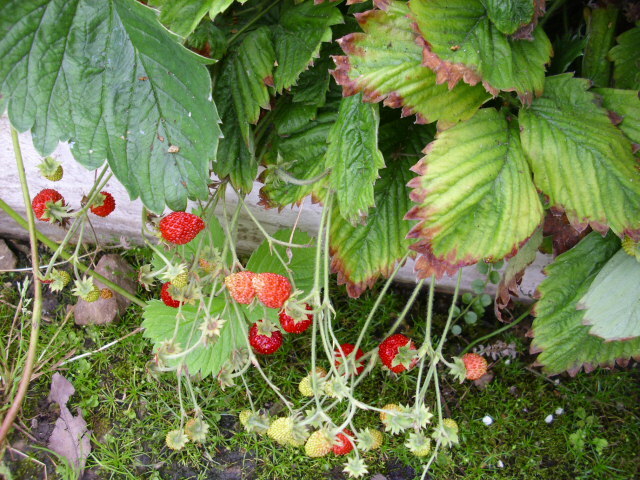 They are almost spent now but this little Alpine Strawberry continues to give masses of small super sweet fruits. Not juicy like the big Strawberries but the flavour makes up for that. It does’nt send out runners so all it’s energy goes into making fruits. 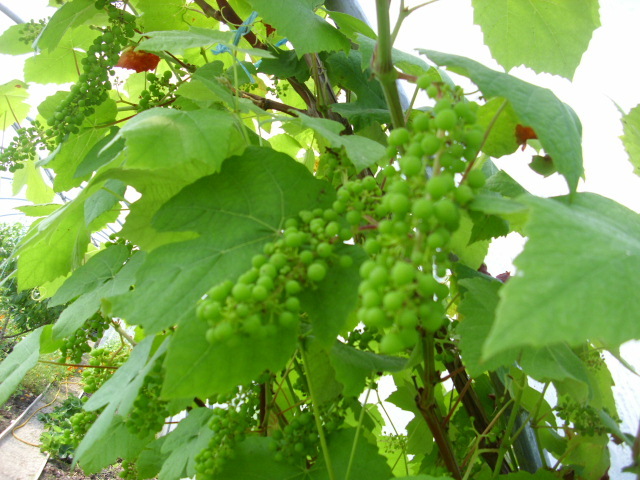 In the big polytunnel the Grapes are filling out nicely, should be a good crop by August. These are Black Hamburg, a dessert grape. 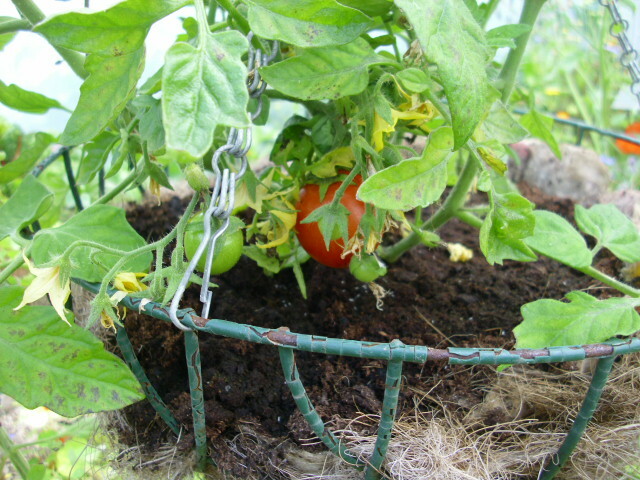 The first Tomato was ripe today from this hanging basket variety. Oh the smell! Delicious! The essence of Summer for me. 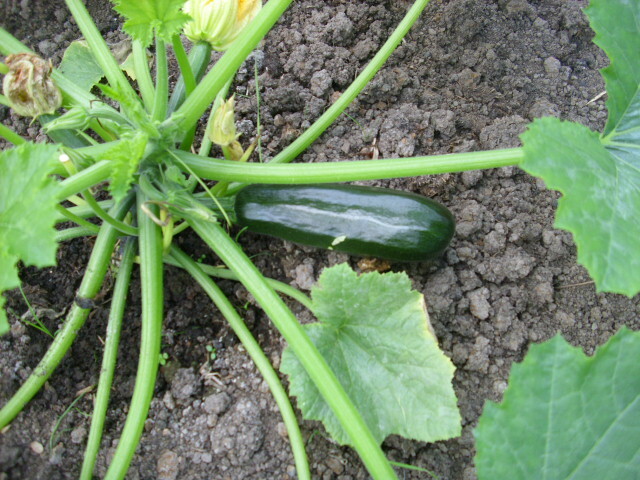 The first Courgette also presented itself today. Later than usual but most welcome. I suppose we will have a glut of them soon enough. 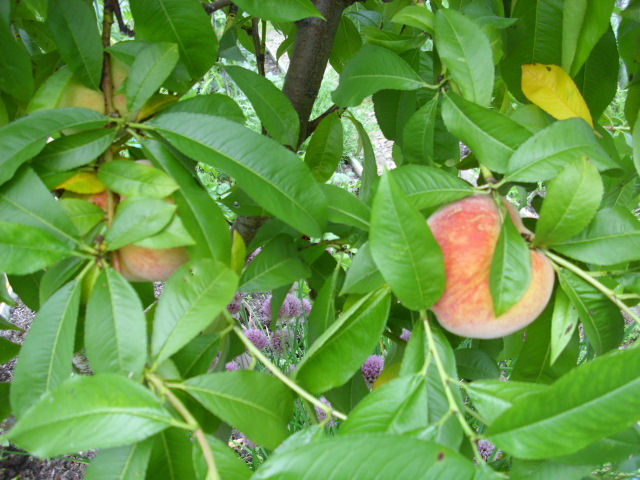 Peaches are starting to blush. Amazing how they are ripening really considering we had very little sunshine in June. 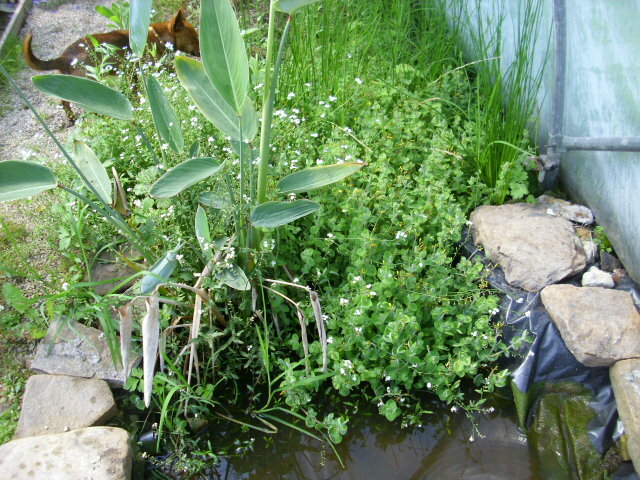 The plants in the little pond at the bottom of the polytunnel are doing well…Flowering Rush and Water Forget me Not planted last year have established nicely. The tadpoles are still there…no sign of them turning into Frogs yet!! 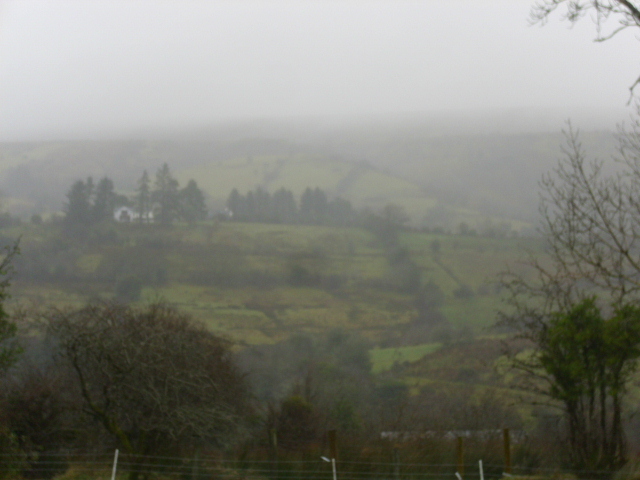 Ireland is famous for it’s greenness…there is even an old song that mentions Ireland’s 40 shades of green. 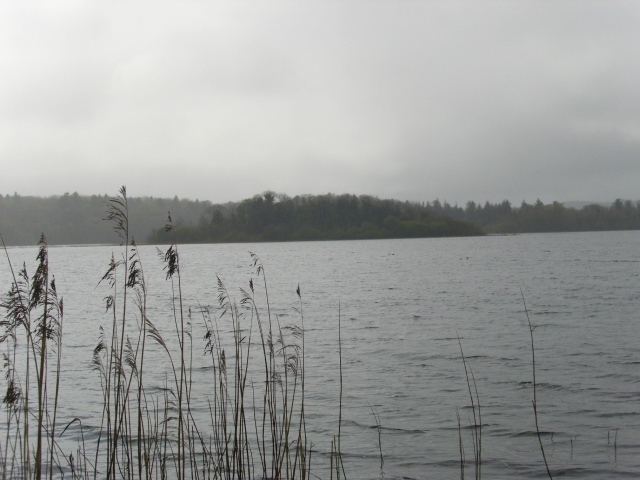 We may complain about our weather…all that rain can be wearing…but it is that very rain that makes Ireland the lush, green place it is. 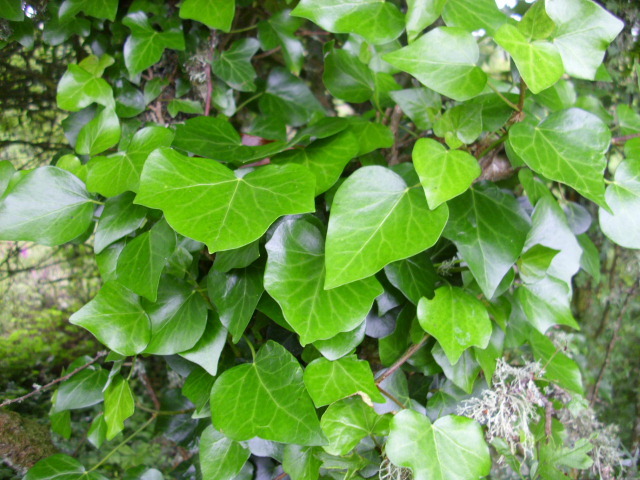 Green is such an important colour…it is the colour most often accociated with Nature and being in the countryside. It is the colour of the heart chakra and is in the middle of the colour spectrum. It holds the balance between the red, hot end of the colour spectrum, and blue, the cold end of the colour spectrum. 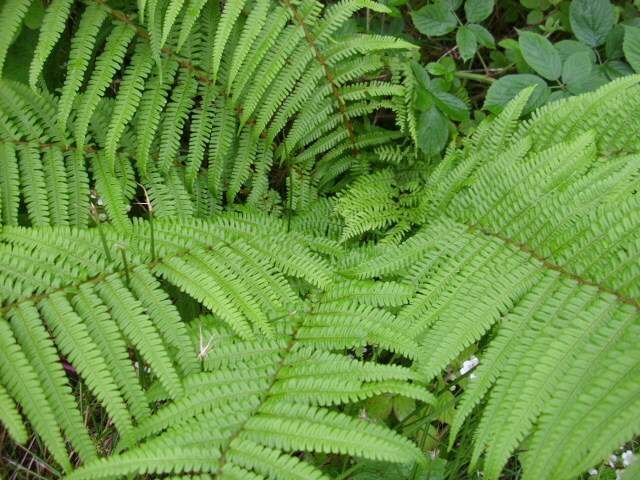 Green is soothing and helps to reduce feelings of turmoil and negativity. Everyone feels better after a walk in a cool green forest. 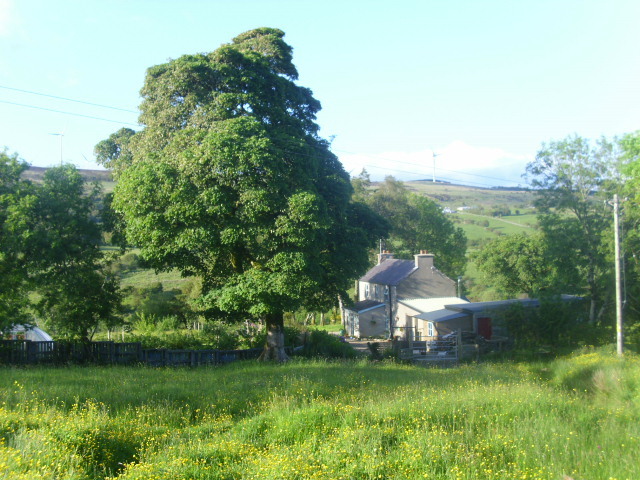 Tourists are drawn to Ireland because of the slow pace of life here, away from the city anyway, maybe it is the predominance of green that helps people to chill out and have time to stop and chew the fat (chat). What can be more soothing to a person’s soul than gazing into the green canopy of a beautiful tree…even if the sky behind is grey! Green food is full of vitamins and minerals which help to keep our bodies in balance. “One of the causes of heart disease is a diet low in the antioxidant vitamins C and E and beta-carotene. Green leafy vegetables are a particularly rich source of these.” Secrets of Colour Healing by Stephanie Norris. On Earth Day…Commandments for the Earth. 1. Thou shalt love and honour the Earth for it blesses thy life and governs thy survival. 2. 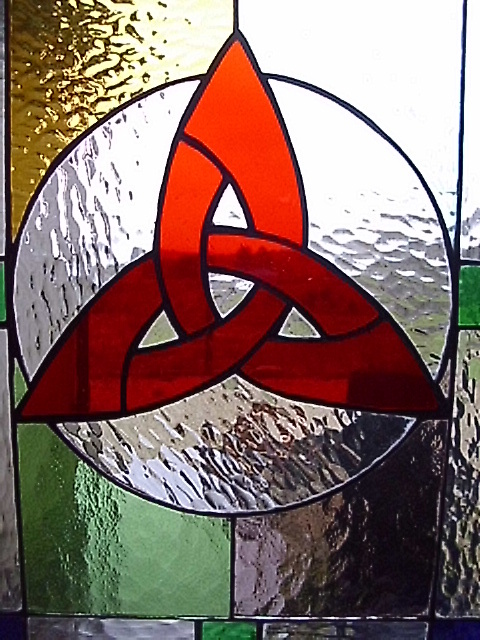 Thou shalt keep each day sacred to the Earth and celebrate the turning of the seasons. 3. Thou shalt not hold thyself above other living things nor drive them to extinction. 4. Thou shalt give thanks for thy food, to the creatures and plants that nourish thee. 5. Thou shalt limit thy offspring for multitudes of people are a burden onto the Earth. 6. Thou shalt not kill, nor waste Earth’s riches upon weapons of war. 7. Thou shalt not pursue profit at the Earth’s expense but strive to restore it’s damaged majesty. 8. Thou shalt not hide from thyself or others the consequences of thy actions upon the Earth. 9. Thou shalt not steal from future generations by impoverishing or poisoning the Earth. 10. Thou shalt consume material goods in moderation so all may share the Earth’s bounty. These commandments were written in 1990 by Ernest Callenbach. If only we would live by them. my only sunshine. You make me happy when skies are blue. So goes the words of a song that I think everyone knows. I’m very happy to think I may bring a little bit of sunshine to a few people’s days through my blog and of course in my “real” life too. Some people seem to think I do. Kevin over at www.nittygrittydirtman.wordpress.com and Michelle at www.atouchofthedivine.wordpress.com have both nominated me for the Sunshine Award. As both of these people have great blogs themselves I am truly flattered. Thank you both! As with all awards there are some rules. First include the Sunshine Award logo in your post. Second: link back to the person who nominated you. Both of those done. 1. What is your favourite colour? Purple. 2. What is your favourite animal? Dogs of all shapes and sizes. 3. What is your favourite number? 3, don’t know why, it just is! 4. What is your favourite non-alcoholic drink? Pure, clear water. 5. Which do you prefer, Facebook or Twitter? Twitter. 6. What is you passion? Life, gardening, nature. 7. Do you prefer giving or receiving gifts? Both equally. 9. What is your favourite day of the week? Lazy hazy Sunday. 10. 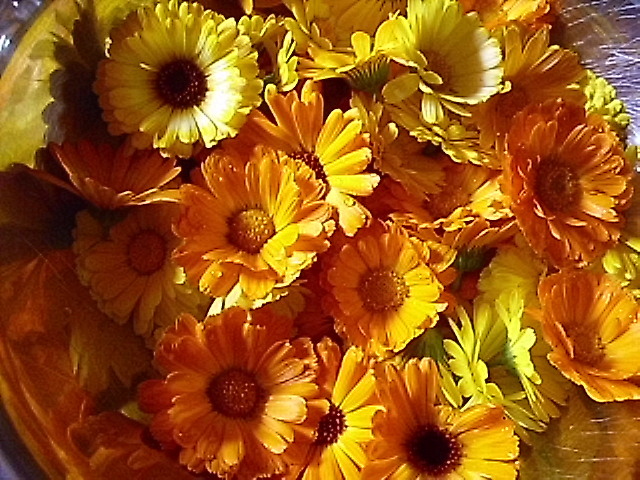 What is your favourite flower? None. I love them all, big and small. 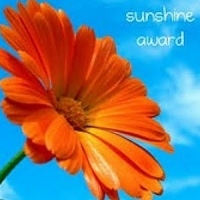 Next thing is to choose 10-12 other bloggers to pass the award on to, link them to the Sunshine Award. Inform them of the award in their comments section. So hear are my 10 choices. It’s always hard to choose as there are so many great blogs out there in the blogosphere. 1. www.zebbakes.com blogging about baking, gardening and walks in green city places. 2. www.godguidesme.com beautiful photography, mostly in the desert. 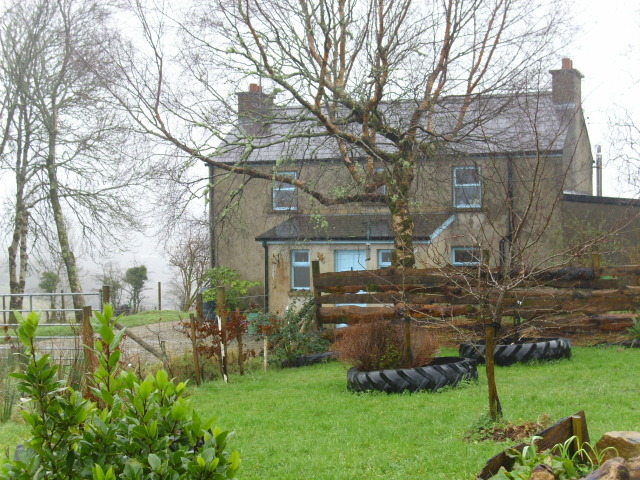 3. www.wellywoman.wordpress.com gardening in wellies, in Wales. 4. www.littlehousecollective.wordpress.com Slow-living, crafting and permaculture in South Australia. 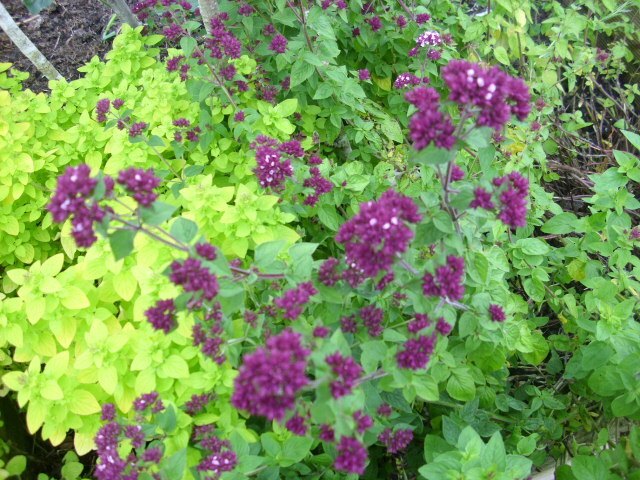 5. www.promenadeplantings.com a blog that seems to alternate between gardening and skiing. 6. www.thepygamagardener.wordpress.com as it says: gardening in pyjamas! 7. www.mossandivy.wordpress.com home & garden, antiques, books and all things beautiful. 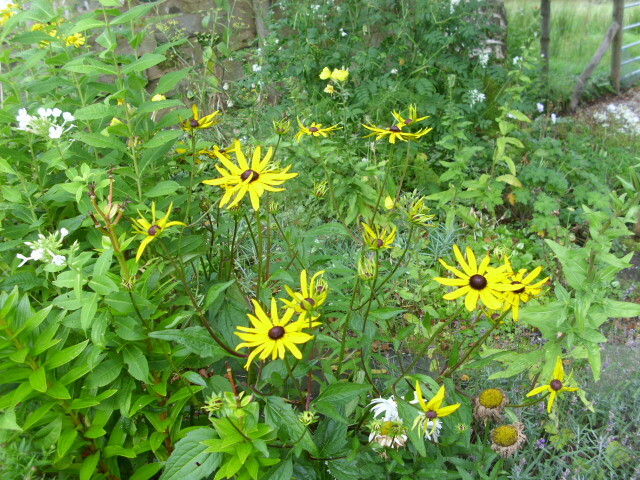 8. www.mybiodiversitygarden.wordpress.com ecology,and biodiversity in the garden. 9. www.frugalfeeding.wordpress.com good food on a small budget. 10. www.crowingcrone.wordpress.com a wise woman speaks. These are just some of the blogs that bring sunshine to my day. 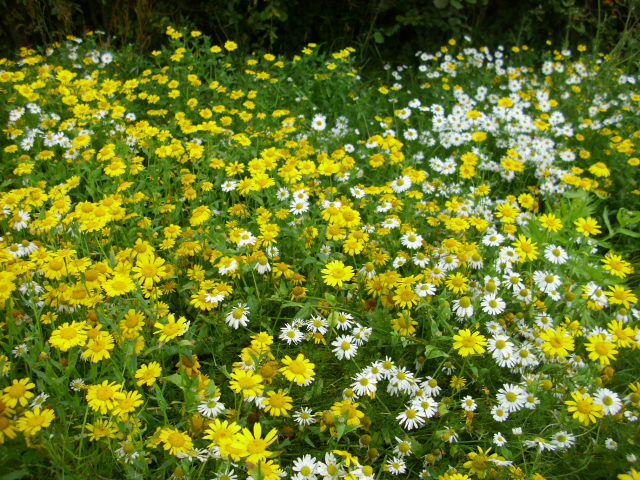 Do visit some of them… they may be just what you are looking for… sunshine in a blog. Gifts come in many ways. From friends, family, husband or wife or even people you “know” through their blogs. One such gift was the Very Inspiring Blogger Award given recently by Kevin over at www.nittygrittydirtman.wordpress.com . Thanks Kevin, I do appreciate your kind words and the award. 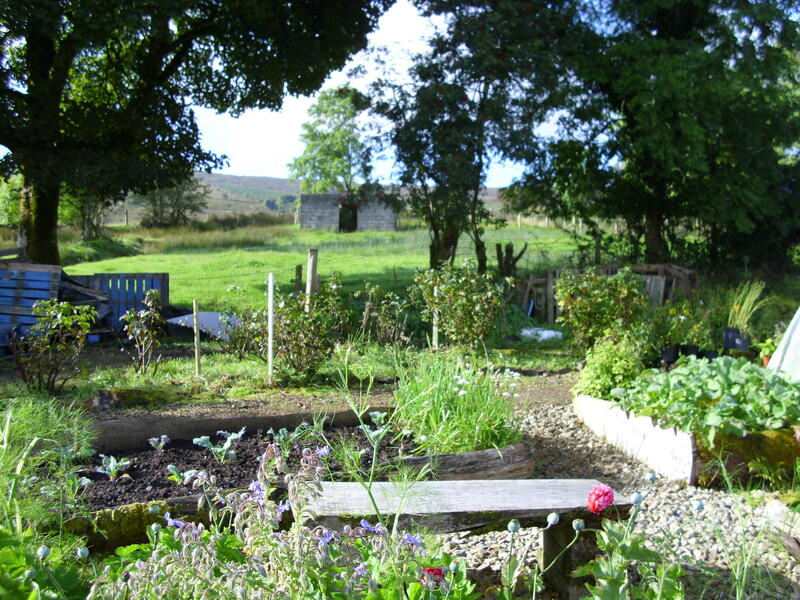 Kevin’s blog is often about gardening but not exclusively. Always entertaining though! To accept the award I must nominate other blogs to also receive the award. I always feel weird about doing this as each blog is that person’s effort…I do not wish to name individual blogs on this occasion. 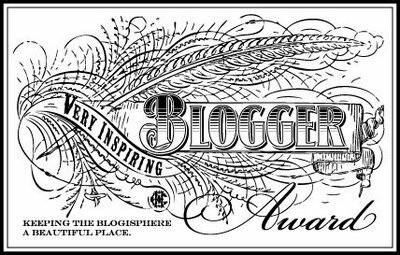 If I follow your blog that means I like it… so to every blog I follow do take the award and pass it on. Maybe someone who has a blog needs a lift or a bit of appreciation…nominate them and make their day. Another condition is to reveal 7 random facts about oneself. 1. I love wool but it irritates my skin so I can’t wear it. 2. I have a strong sense of justice. 3. I don’t like people who lie…it is an insult to anyone’s intelligence. 4. My most recent discovery about myself is that I have ADD (attention deficit disorder). 6. I believe in Angels. 7. One of my fave meals is basmati rice topped with a good helping of mung bean dhal. Delicious! Another unexpected gift came my way yesterday…this lovely little Japenese hoe. Isn’t it lovely? 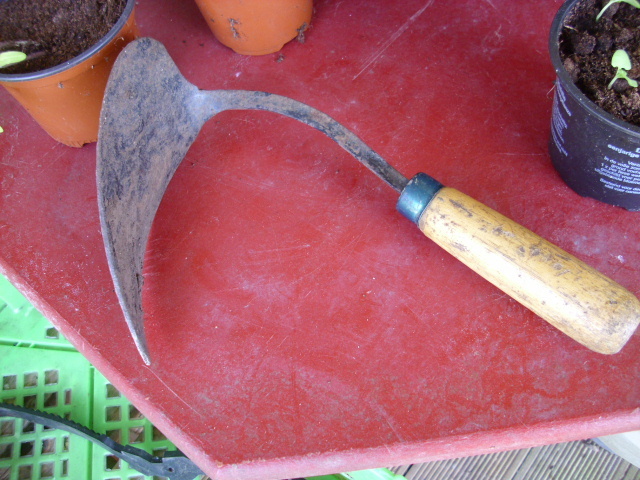 I spent a few hours helping a friend in the garden and admired this lovely tool. Her reply was “I’m left handed so I can’t use it. Would you like it?” Not one to look a gift horse in the mouth I accepted the gift gratefully. 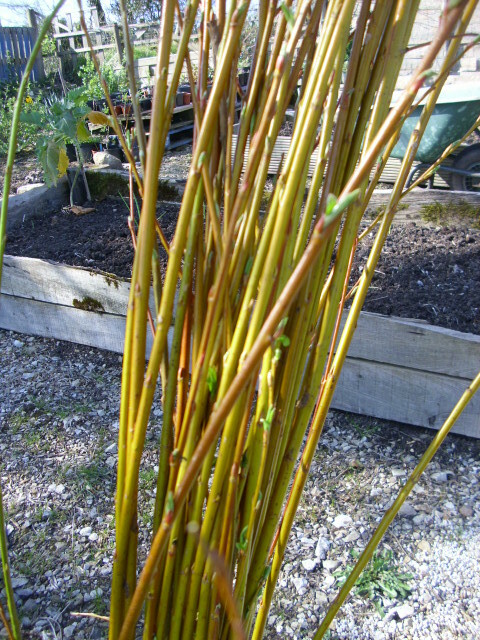 When visiting another friend last week I was offered a bunch of rooted Willow cuttings. I’m sure I can find homes for them in the hedgerows. Might even make a fedge with them. They will take off instantly at this time of year… decisions…decisions! I love their bright yellow colour. It only comes on new growth though so they would have to be cut back each year to get this. A fedge is looking more likely! 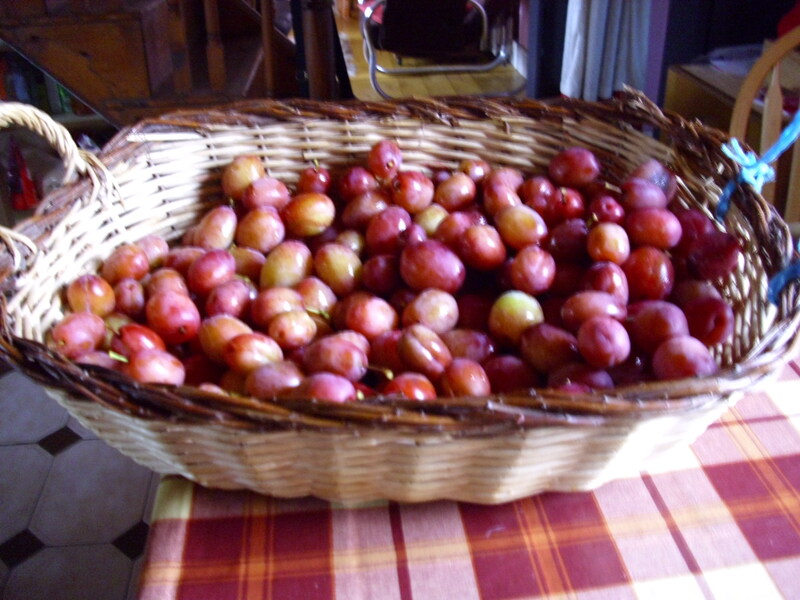 The garden has started showering us with gifts too, not that it ever stopped! 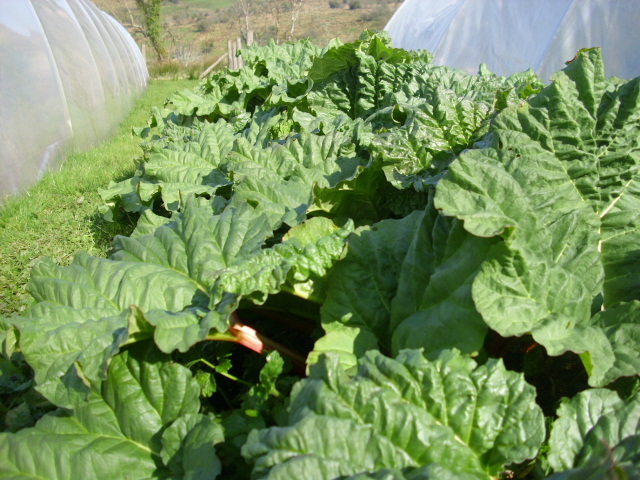 Rhubarb has shot up and is ready for picking. Crumble on the menu soon! Rhubarb is a great crop in any garden. 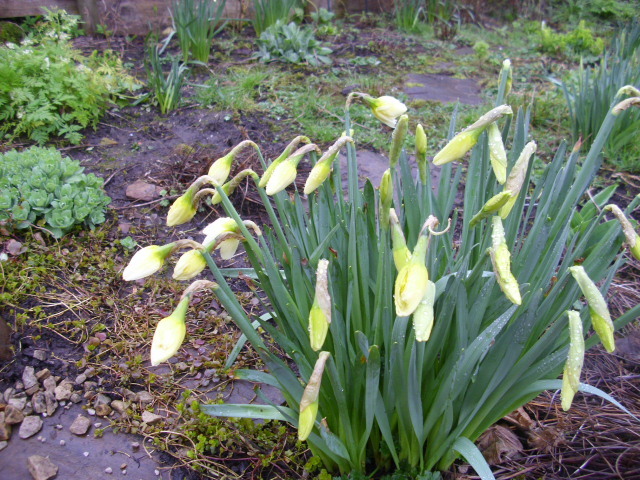 It requires very little attention apart from a mulch of manure each Winter. It can be used for jams, chutneys, crumbles and even cakes. 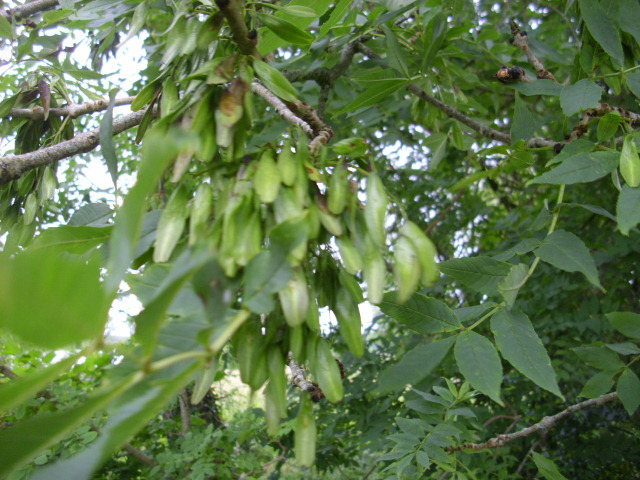 Even if you don’t like it as a food the leaves contain oxalic acid and make a great natural pest repellant. 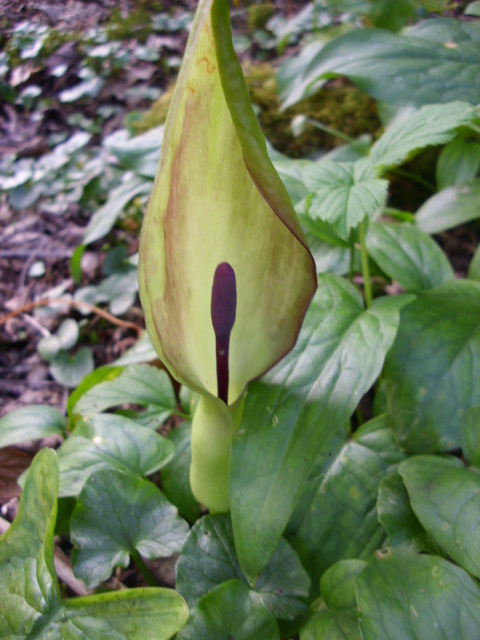 Finally a gift from nature…this beautiful Arum Lily…Arum maculatum…spotted in the woodland whilst walking on Sunday. Isn’t it fab!! There are many common names for this plant, cuckoopint, lords and ladies, willy lily and parsons lillycock to name but a few. 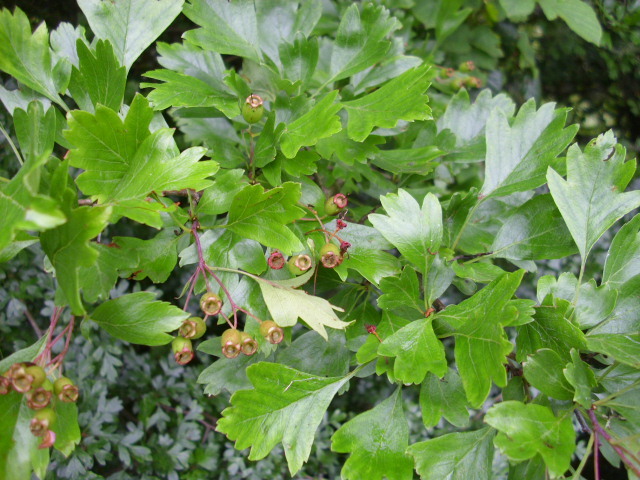 In the Autumn it has poisonous red/orangey berries. Even the weather has been generous this week. The weather has been beautiful! Sunny and dry all week. Life is good! I am thankful. The stone moving continues @ Prospect Cottage. 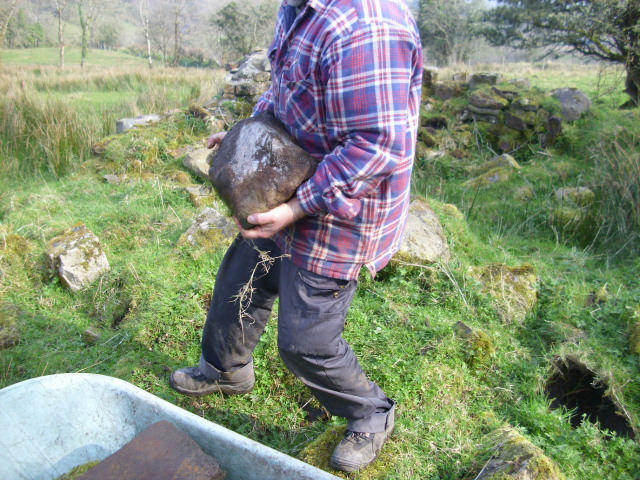 The moving of big stones from the back field down to the garden continued today. 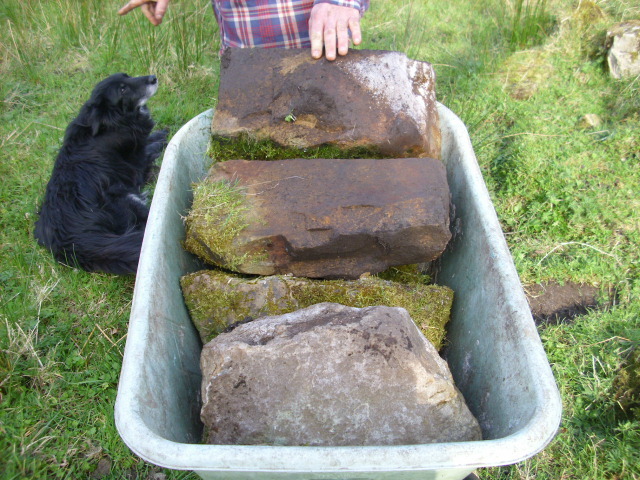 We have decided to leave the remains of the little house and use the stones which are spread around the area. These must have been from an old wall. Same type of squared off cut stones. They were quite clever in the situating of the house. Down in a hollow sheltered from the prevailing winds. Nowadays the new houses are built without any regard to orientation. he could bring 5! Showoff!! 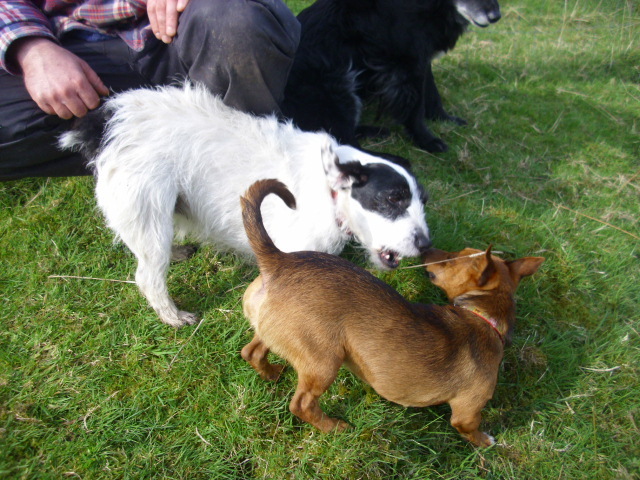 then a bit of playing. Down in the garden the stone edging looks good. All the boards will have to be gradually replaced as they have been in place for 8 years and are starting to rot. Can you see the hole in the centre of the biggest stone? This stone would have held a metal gatepost in days gone by. 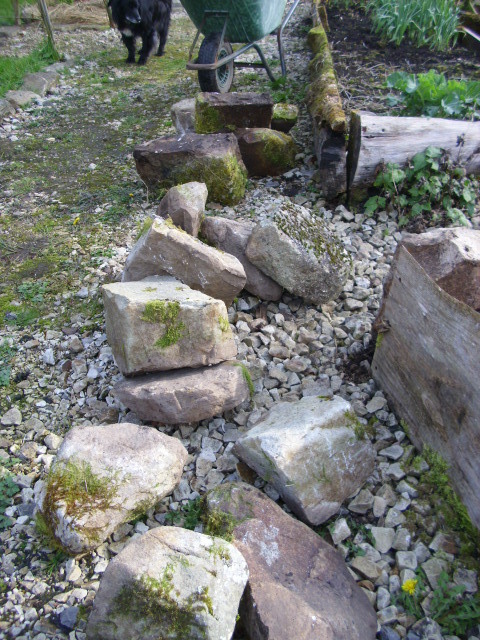 More stones wait to be given a new lease of life in their new garden home. Repurposing is I think the new word for recycling. Reuse, recycle, upcyle, repurpose. Whatever you want to call it is fine with me. Friday Fotos from Prospect Cottage. 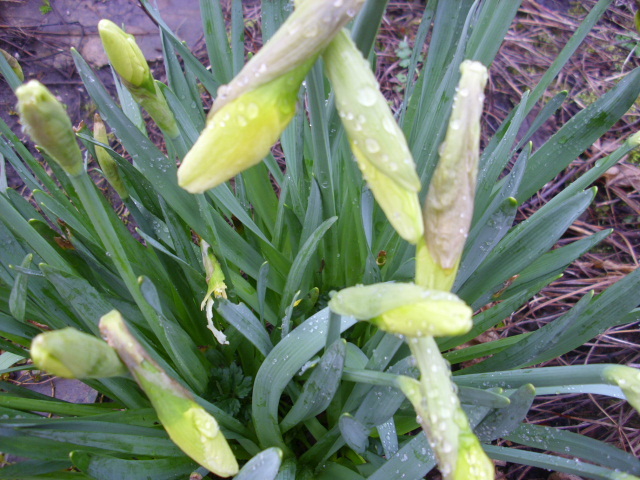 Daffodils about to bloom…these should be in flower for St. Patrick’s Day. Lots of growth on Summer flowering plants in the background. Tete a tete still in flower. 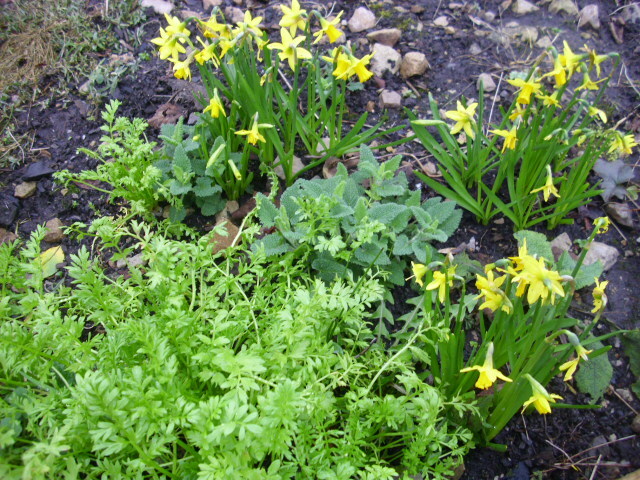 Poached Egg plant, in front, survived the mild Winter. 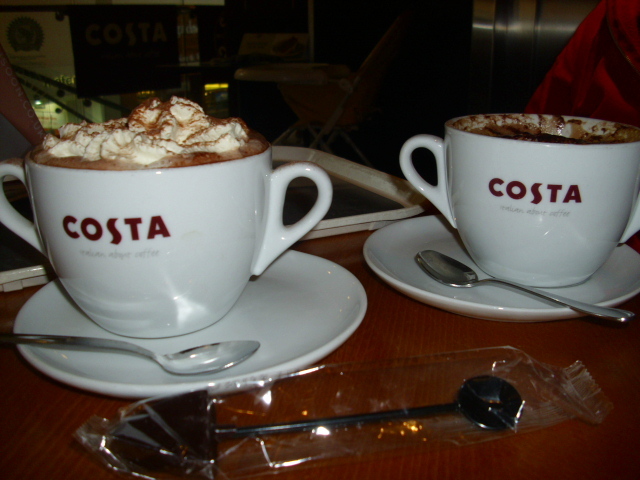 Hot chocolate in Sligo…did’nt realise the “large” would be quite this big! We managed it though! 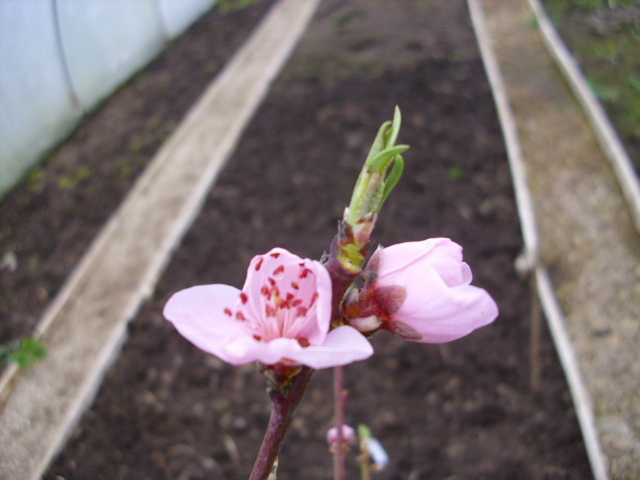 First Peach blossoms in the polytunnel. 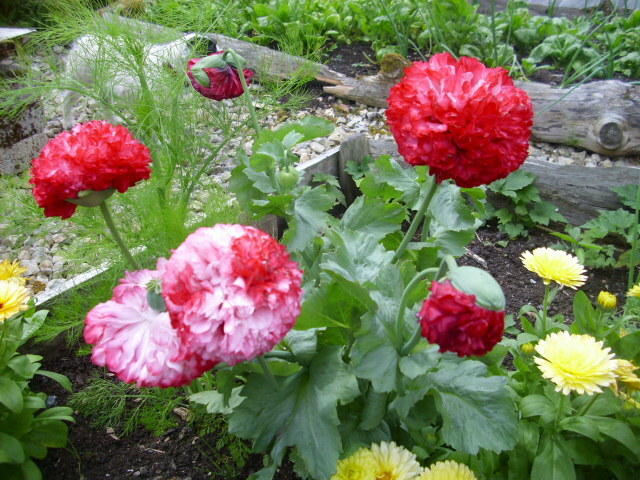 I will hand pollinate these when all the blooms are out. Not enough insects yet to do the job. 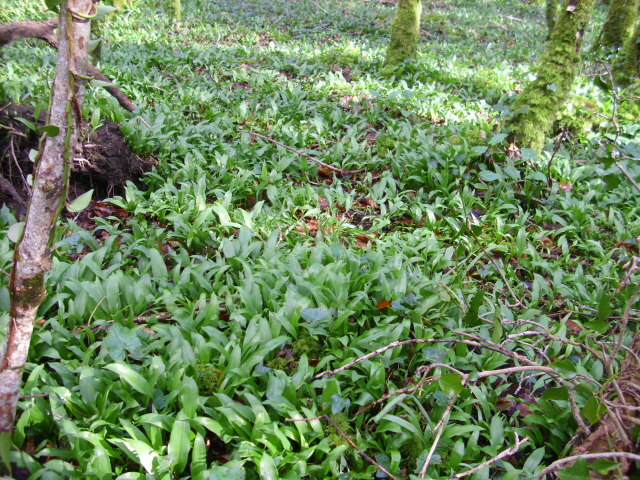 The first forage…picking Wild Garlic in Lough Key Forest Park. 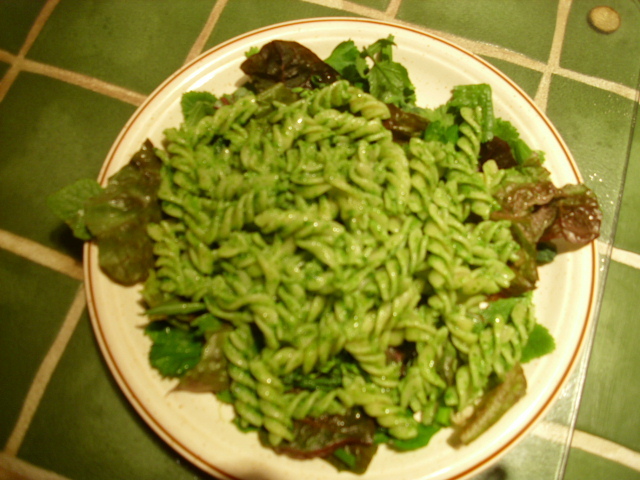 Made Wild Garlic and Parsley pesto. Delicious with pasta and home-grown salad. 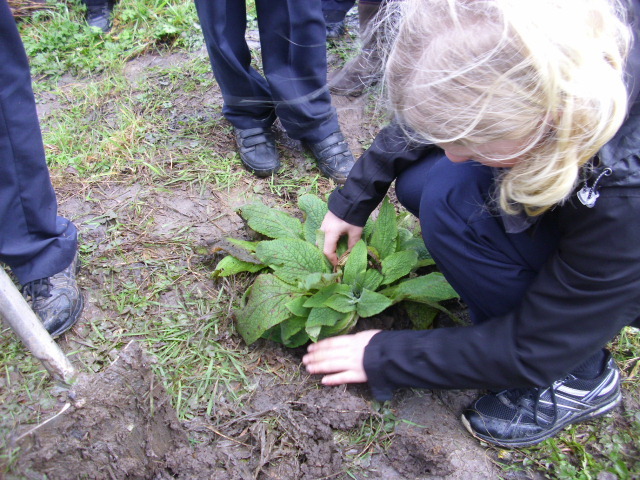 Planting Foxgloves with local school children. The teacher told me the old local name for Foxgloves is Fairy Fingers. Today was a real crazy weather day. 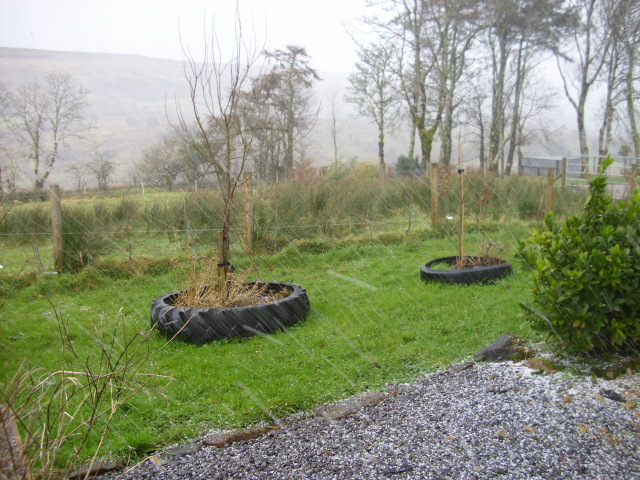 We had everything… beautiful sunshine, gale force winds, hail, snow and rain! Despite the weather I managed to continue with my Moon planting. Today was a fruit day, in this category are all those plants which have their seeds within the fruit. 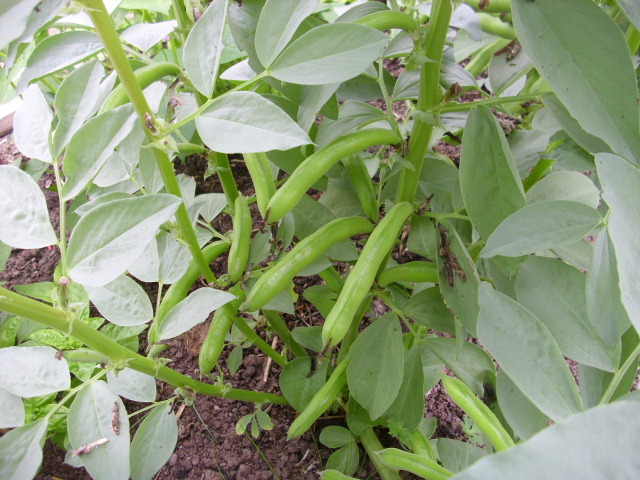 I planted, in modules, Broad Beans, Peas and Sugar snap Peas. All the seed trays are in this contraption in the polytunnel. It is an old metal bunk bed which is covered in plastic. It works fine even though there is no heat mat. I think plants are tougher when brought on without extra heat. 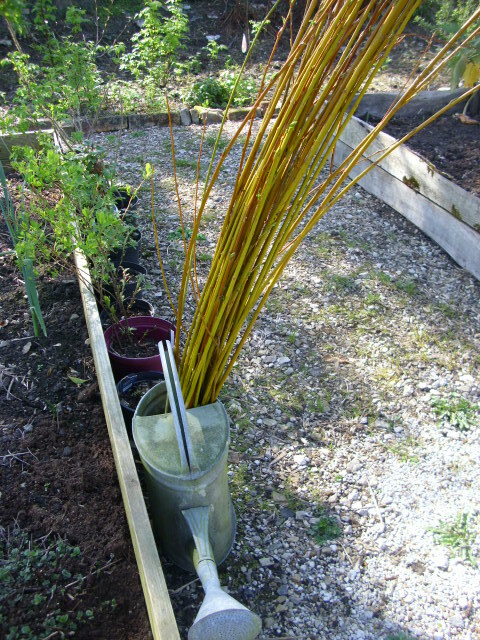 I do sow Tomatoes and Peppers in a small propogator though, then harden them off when they’re potted on. 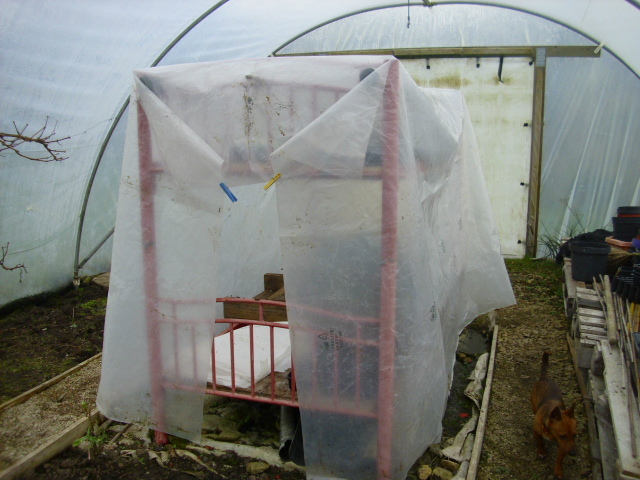 These sowings are doing fine in the cocooned environment under the plastic. 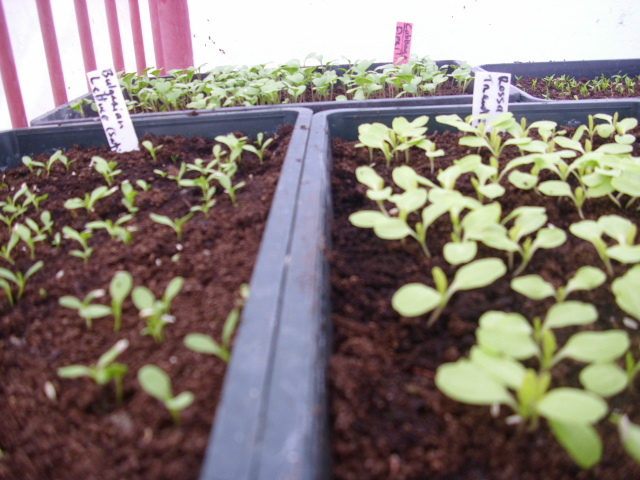 Three types of Lettuce, Cabbage, Flat Parsley and Curly parsley from earlier seed scatterings. 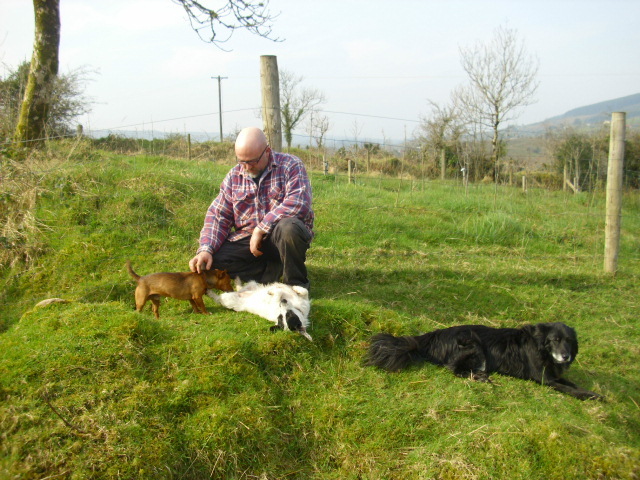 I did’nt stay out too long today, just enough to plant the seeds and walk the dogs. It was a short walk today! 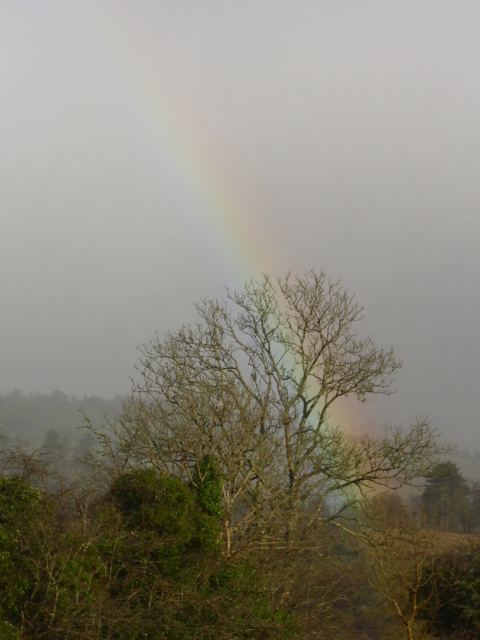 As evening approached there was hail again and out of it emerged a rainbow. I stepped out the front door to take the pic, then quickly in again. Yes, March many weathers! 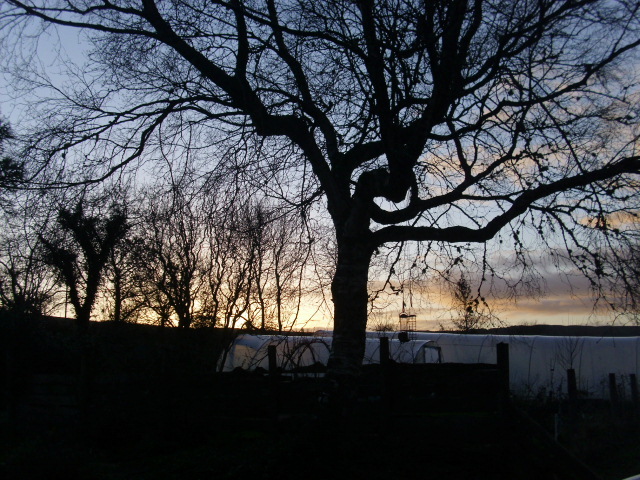 Musings from a Smallholding…on a wet Irish Day. 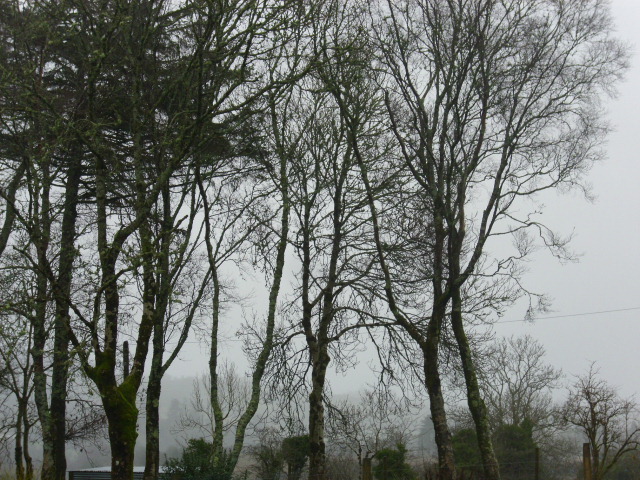 Today is one of those days that typify our wet mild climate. 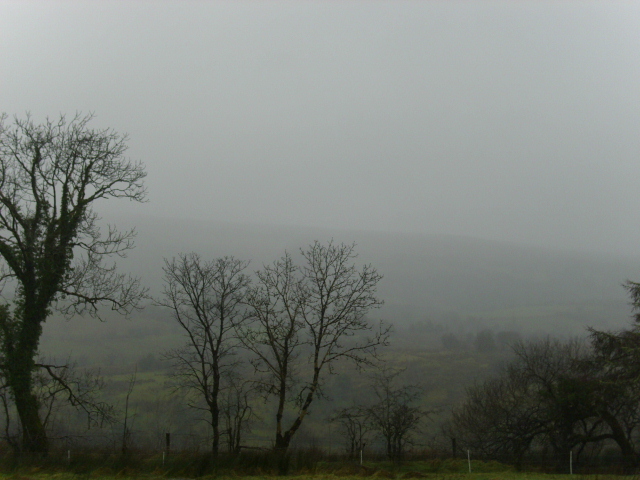 Since morning we have had rain… soft rain… the sort I call mizzle, a cross between heavy mist and drizzle. The mizzle gives the place a misty, mystical look. It would be a great day for filming a spooky movie. What could be lurking in those trees? All is quiet at this homestead across the river. The only sound is a dog barking in the distance. Maybe he is spooked by the mizzle! I really wanted to work outdoors today. 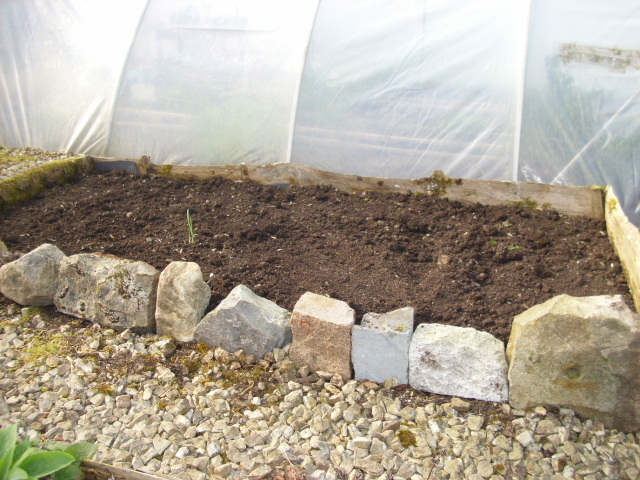 The soil is too wet for working on the outdoor beds so I weeded and dug over a bed for Strawberries in the polytunnel. 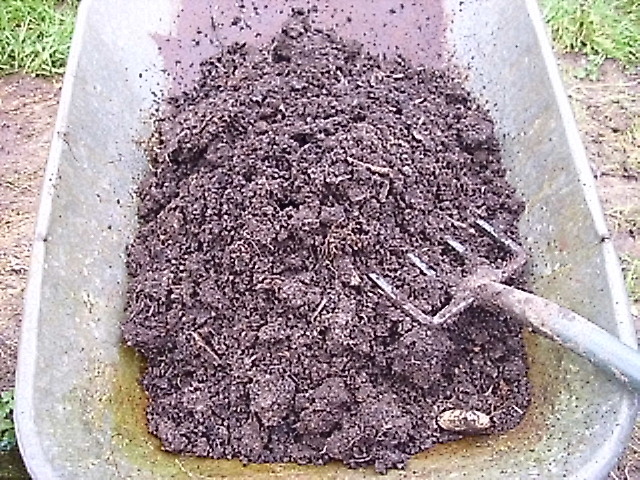 After digging I spread over some of this lovely compost. It is about a year in the making and is a lovely dark loam. Tomorrow I will plant the Strawberries. 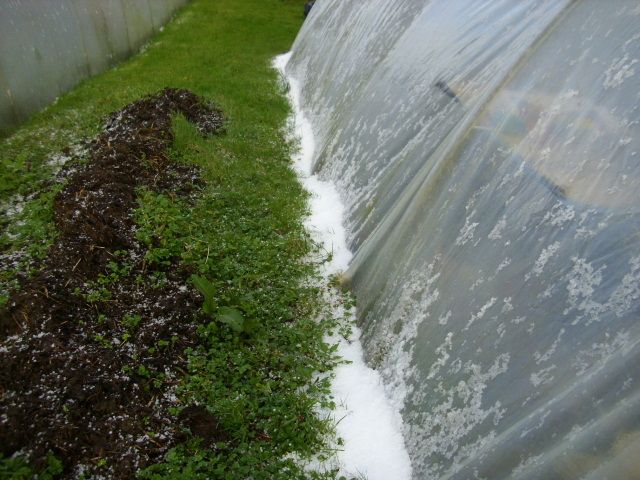 I have given up on planting Strawberries outdoors as the last 2 wet Summers were a disaster. The day was not cold but the mizzle made coat wearing a necessity. 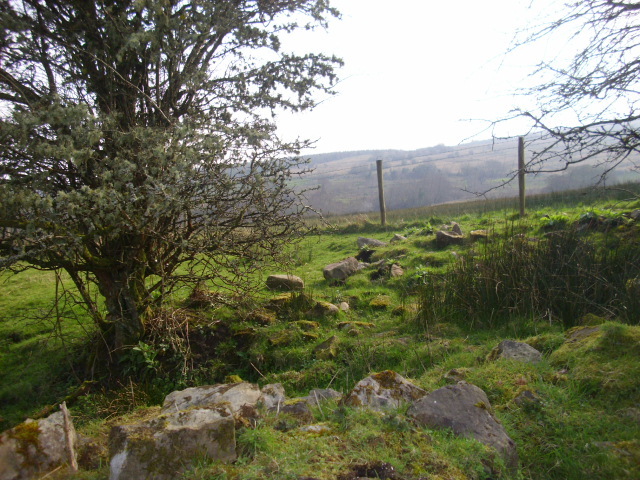 The mild Spring has ensured lots of fresh green grass and fresh growth on all the shrubs. You can see the new growth on the Bay on the left. I really look forward to the trees coming in leaf again. 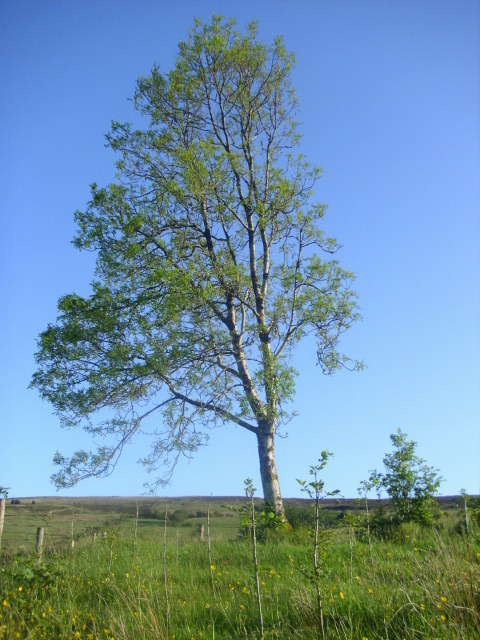 The Birch near the back door is one of my fave trees, especially when it’s got it’s new fresh leaves. 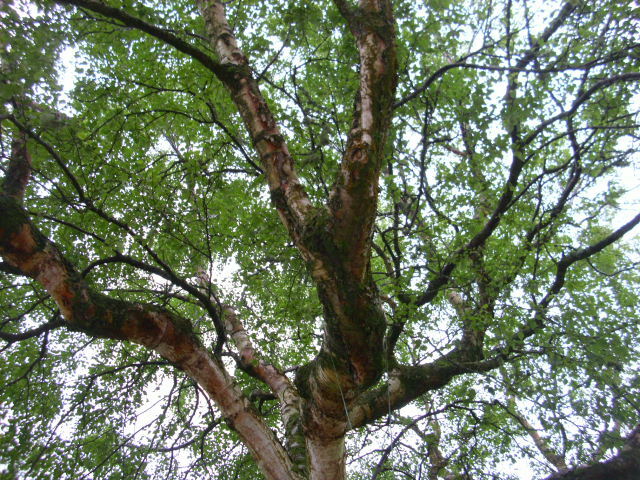 In Russia Birch trees are tapped in the Spring. This is done by drilling a small hole in the tree when the sap is rising. A straw is inserted to direct the flow of liquid into a vessel then the hole is plugged again. The resulting clear liquid is drunk as a Spring tonic. It can also be boiled down to make a sweet syrup. Anone out there ever tried this? We are going to do it this year so I’ll keep you posted! 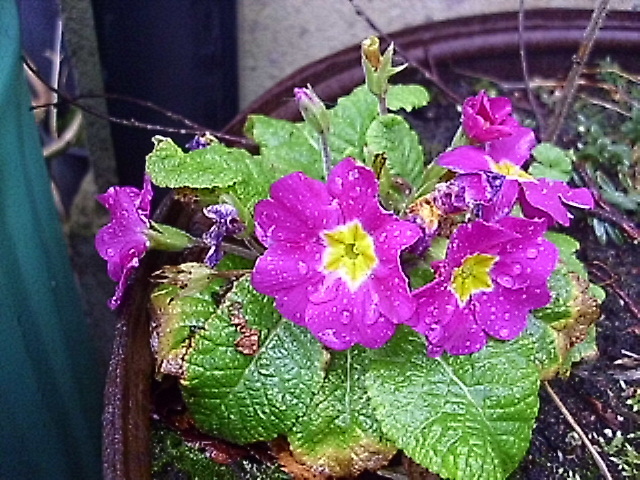 This little Primula is flowering in a pot by the back door. It catches my eye every time I pass it by. Purple is one of my fave colours. It is said to distract the mind from everyday concerns. 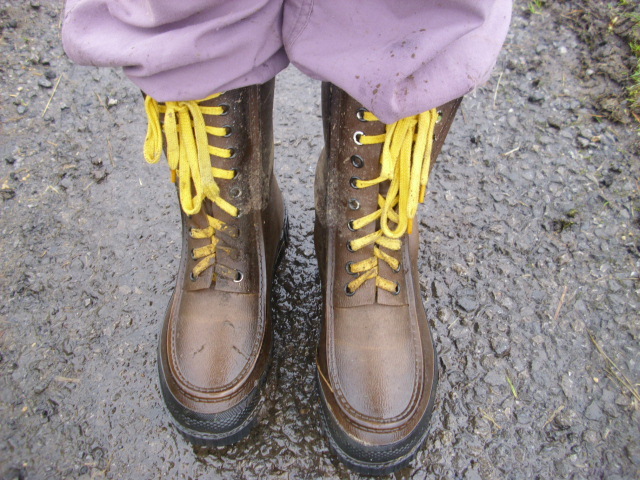 The wet day gave me a chance to wear my new wellies. I got them in one of the local charity shops. They were brand spanking new so I was happy to pay the 10 euros asked for them. Oh dear! I’ve got the laces dirty already. Oh well! 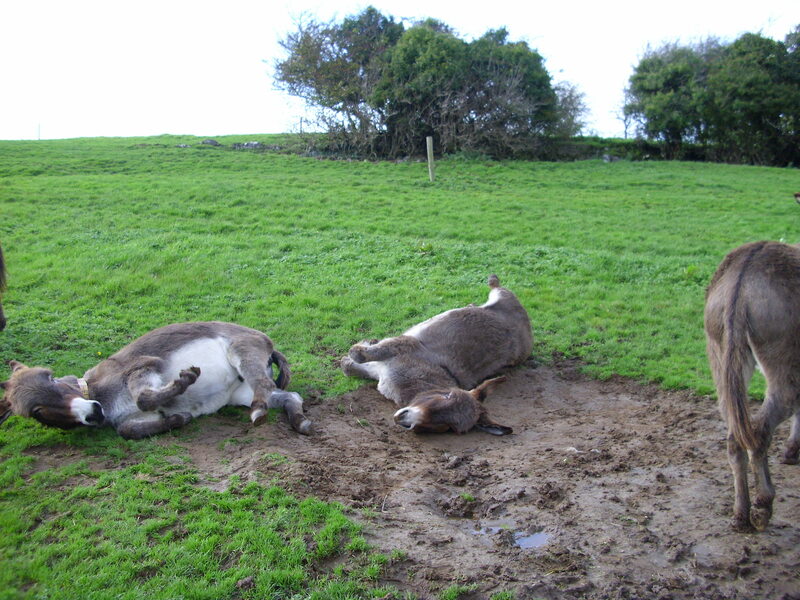 That’s the joy of a wet Irish day! As we face into another year on this planet called Earth many people are feeling a bit scared about 2012. Much has been said about Mayan calendars, solar flares and biblical prophecies foretelling the end of the world. My view…for what it’s worth…is that the Mayans were not foretelling the end of the world but an end of an era. I came to this conclusion after reading much about these various prophecies. My belief is that 2012 is the time for a change in consciousness on the planet. We are all exploiters on this planet…that is the nature of the beast. Even Andy and I living here in rural Ireland are exploiters. No you may say…but the truth is yes. We are vegetarian so we do not exploit our animals for food directly. We do however exploit Enid our milking goat every day to obtain her milk. Hens are exploited to produce our eggs and bees for honey. A bit extreme you may think but we cannot blame others for exploiting without examining our own conscience. We have a car so…somewhere… fuel has to be pumped out of the earth to power it. None of us on this Earth can live here without being part of the exploitation that occurs. But…we can exploit in a positive way…positive for ourselves and life on this beautiful planet. So much food is imported needlessly. Growing your own means you can be more responsible for your own nutrition. Food sovereignity gives one more financial independence as less money is needed. I really hate the supermarket trend of importing vegetables from all corners of the world to gratify our taste for out of season produce. 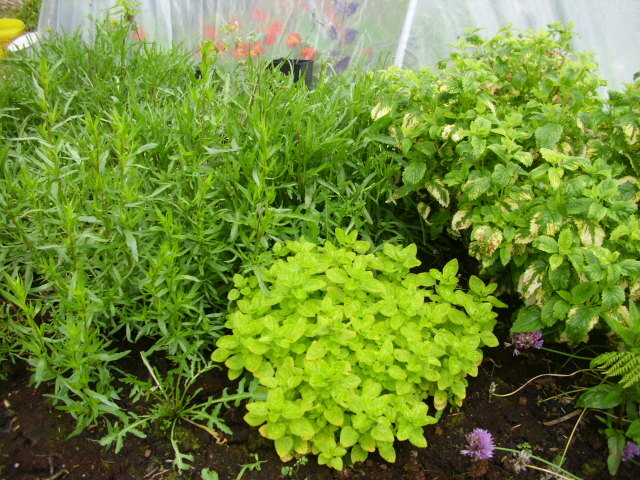 In our polytunnel at the moment we have Carrots, Kale, Parsnips, Spring Onions( I saw some in the supermarket from Kenya), Turnips and salad greens. More than enough for variety. We do of course buy some provisions. We only grow enough Potatoes for half the year but we make sure to only buy Irish Potatoes. We also buy lentils, beans, flour and so many other things too. The Celtic Tiger years (late nineties to 2008 financial boom) seem to have made a huge change in the Irish psyche. They were the years of spend, spend, spend and damn the consequences. A third of food purchased in Ireland used to go in the bin…hopefully the last couple of years in recession will have changed that somewhat. On my travels I pass a local fruit and veg importers depot quite regularly. There is always a skip outside brimming with produce to be dumped. Shameful. 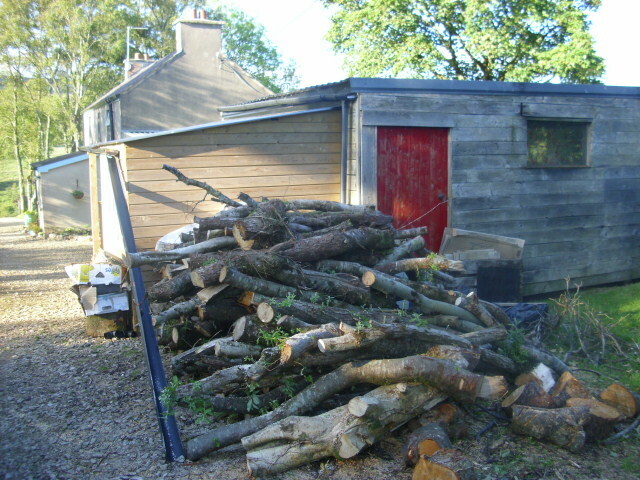 The timber pile pictured above was given to us by a neighbour who did some hedgecutting last year. There were 6 others of similar size. They just could’nt be bothered using it. That was our gain but I do not understand this mindset. Cutting down trees then going to the local fuel depot to buy imported coal. My hope for 2012 is that people do become affected by the change in concsiousness. That more and more people begin to appreciation and cherish this planet that has for so long tolerated our gross exploitation. 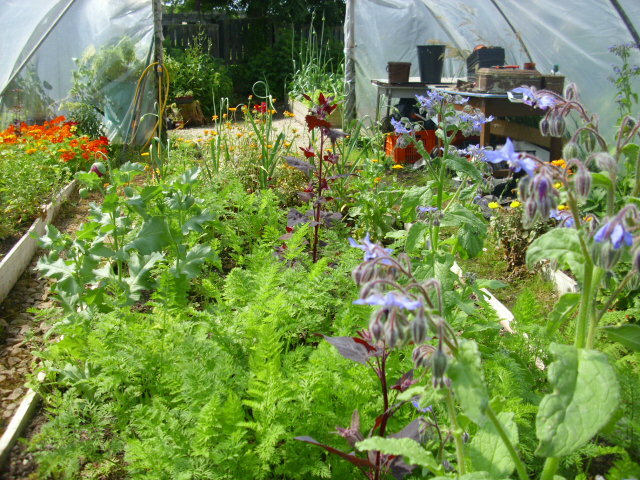 If we all do our little bit to reduce the waste, shop wisely, use wild foods and grow what we can then there is hope. 2012…may it be the year where we take responsibility for our actions. A change in consciousness…I welcome it with open arms!